I have finally gotten copies of David Paulides’ Missing 411 books and am making my way through them slowly (lots of other reading to do). 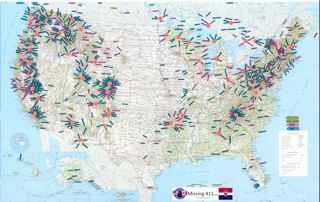 I am finished with the Eastern United States book and will be going on from there. I realize that Mr. Paulides has now moved into some city cases so I am a little behind the times but I felt a need to get down some thoughts and impressions that I have had since I last wrote about this subject. First of all, I will state right away that I am not attached to any one solution for this mystery and, furthermore, that I do not feel that there is a universal explanation of the cases. As I have said in the previous writings just linked, there are multiple causes for these disappearances. My own psychic experiences have only enhanced this opinion. A spirit with whom I have a very close relationship got very uncomfortable when I brought up these cases. Now understand that this being is very protective of me but the spirit warned me outright that some of these cases are the results of predators that “are not of this world” coming through and taking people. I asked specifically if this was related to what humans call ET abduction and the spirit showed me that these ‘predators’ were simply alien and not necessarily in the sense of being off planet. In one shamanic journey that I took, I asked to be shown the site of a recent disappearance. I was transported into a wooded area (sorry, I am not sure where exactly this was – the vision could have been entirely symbolic) and shown a path that led by a huge boulder in what looked to be old growth forest. At first, I did not notice anything amiss but, as I walked around the area in spirit, I became aware that the feel of the place seemed ‘off’. I changed my angle of view and realized that there was, for want of a better term, a hole in the pathway. I approached carefully as the animal guide with me was not happy about any of this and noted that, when I looked directly into the hole, my perception was of looking into space. I believe that anyone who walked into the hole would not likely be seen again. As I read the Missing 411 book noted above, it became obvious that, in many instances, the person missing could not be tracked by dogs and left little sign behind for human trackers. In those cases where tracking did work, the subject behaved in a completely uncharacteristic manner – wandering off of safe trails, out of back yards, away from the safety of homes – only to disappear and either never be seen again or to be recovered later under mysterious circumstances. As I read, I could not help but recall the faery lore of Europe where those Faery of the ‘Unseelie” variety, the ones who view humans as prey or, at best, subjects for cruel sport, would attract the attention of a human and then lead them away into the Otherworld. Often this dastardly deed would be accomplished by the appearance of lights that led the subject into a swamp or marsh (geography that appears often in the 411 cases) or by the use of glamour to make the person believe they were following a trusted companion or by the use of glamour to seduce the traveller into following. In any event, the person who was Faery led generally disappeared completely (or sometimes drowned in a swamp) and was only ever seen again if the Faery released him or her, often through the exigency of a concerned relative who knew the lore of recovery. Given my own impressions of heavy Faery activity in an area not far from one of the Missing 411 clusters (I lived for a while in the Catskills, near the Adirondacks) and the discomfort expressed by both spirit helpers above, it certainly seems likely that some of the predators not of this world are Faery in origin and, if we look with eyes to see, we understand that there is a large body of lore that bears on the Faery kidnapping humans, particularly children. I would note, too, the prevalence of bad weather following these events; The Fae certainly have the ability to effect local weather patterns and have been known to do so when locals aroused either their affection or ire. 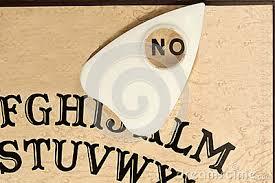 A Safe Method for Using the Ouija Board? We all placed our fingertips on the planchette while I asked if any spirit was with us, to let it’s presence be known to us. I continue this for another 15 minutes. Nothing happened. As I have noted in my other posts, such actions are the equivalent to lighting a beacon on the astral and then waiting for something, anything to show up. Would you walk out into a city street and randomly hand out invitations to your home to perfect strangers? Why then, would you issue an open invite to any spirit that was around to come tromp around your house? Given all the above, I have heard of ritual magicians using these boards with good success in evocation rites. As I have said, I have never tried this and really have no desire to since my own communications with the spirit world are far more personal. However, not everyone who assays the magical path has mediumistic tendencies and, for some mages, spirit communication is very hard work. If you read some of the texts from the Golden Dawn or Crowley, you will note that often a spirit evocation requires two people, the operator of the ritual and a sensitive or medium who actually does the spirit communication and relays that information to the operator. In some ritual magic texts, the magician is even encouraged to use a child for this purpose, the assumption being that children are more open to spirit presence than hardened, materialist adults. Of course, the two person operation is the ideal. As you can imagine, given the native secrecy of most magicians, it is difficult to find people who are not only willing but able to participate in such rites. If the magician is forced to do an evocation on his or her own, then he or she has to either a) have some mediumistic talent of their own, b) use a tool such as a ouija board to aid the communication, or, c) be able to summon the spirit to physical appearance. Yes, it is possible to summon a spirit to physical appearance (or at least the perception of same) in order to have a chat. If one is going to use a ouija board then I think that it is quite important, for safety’s sake, to follow the basic principles of evocation when doing so. By following those principles, the operator can save him or herself a lot of fussing around and interference from ‘trash’ spirits. 1) Know what you wish to evoke. No throwing the door open to the locals and hoping for the best. If you do not know who you wish to talk to then put the damned board away and wait until you do. Research the spirit, know what it likes and does not like, if possible. Find out if it has a symbol or sigil or mantra that it favors. If you are trying to contact a dead relative, then know as much about that person as you can. 2) Use of a specific magical system. If you are not conversant with magic, then take the time to do some research on how to effectively set up a protected space to work in. If you’re something of an anarchist, study Andrieh Vitimus’ Hands On Chaos Magic for loads of good ideas for learning how to do this. 3) Learn to enter what ritualist E A Koetting calls the Theta/Gamma sync. Koetting is known as a “dark” magician and is quite the salesman but he knows what he is talking about when it comes to evocation. Theta/Gamma is the brainwave state where, for example, one is dreaming but can move so you might think of it as the place you enter right before going into deep sleep. 4) Gather your contact material – symbols, mantras, sigils associated with a spirit or, if you are doing an ancestor, pictures, clothing, personal effects. 5) Set your ouija board up in the work area where it can be easily manipulated while you are in trance and use the ritual that you have learned in # 2 to open protected space and consecrate the board to your intended purpose. Use your magical system and the contact material to do an evocation of the spirit you are seeking and ask it to speak with you directly through the board. 6) Let yourself go into deep meditation as you perform your ritual and seek to communicate directly with that spirit by the medium of the board. Do not be discouraged if nothing happens the first few times you try this. It may take time to tune to that specific spirit’s frequency. 7) Once contact is established, ask questions and do not accept the answers at face value. Remember the concept of testing the spirits. Ask the being for proof that it is who it says it is. Using a protected space helps cut way down on trash but it may take time to get your tuning just right. 8) Keep initial sessions short – this work is a lot harder than it sounds and your body needs time to assimilate the energies it is being exposed to. 9) Thank the spirit for its aid, close out your ritual space as prescribed by your tradition and then eat something so that you can ground back into the physical world. Does this sound like a huge amount of work just to play with a ouija board? You are correct; it is. But, if you are not willing to put in the time and effort to train yourself, at least somewhat, to communicate with spirits then you should leave the ouija board to those who are willing to do the training. Simply put, if you don’t want to put out this kind of effort, then cease your dabbling so that those of us who have put in the time do not have to spend our time rescuing you! A Cautionary Tale: Know Who You are Talking To . . . In my last blog post, I expounded on the difficulties entailed in Ouija board communication and spoke at some length about the danger of taking spirits at their word without, as even the Bible notes, testing those spirits. As I wrote that piece, I recalled a story which exactly illustrates this point. Many long moons ago, when I still lived in Arizona, I had the pleasure of the friendship of a Wiccan lady of some years experience in her religion. Unlike some, who read a couple of books and then pronounce themselves high priestesses, this person had studied and was, at the time of this story, a second degree member of a British Traditional coven. I knew her to be of sound mind and deep perception so I have no reason to doubt the story which I am about to relate. This woman offered psychic readings on occasion, supplementing her income and, she hoped, giving some needed guidance to the public. She normally worked out of a particular New Age bookstore in her area but, on this day, had accepted the invitation of a new store owner in Tempe to come to a small psychic fair being held at the new store. My friend had some trepidation about doing this fair, since she had heard conflicting assessments of the store owner, but she did not want to pass judgement without at least giving the store and its owner a chance. The Wiccan lady arrived at the designated time on that Saturday and set up her table, noting, uncomfortably, that the space was going to be packed with readers. She had no difficulty with other readers but felt, looking around, that the store owner was, perhaps, being a little overzealous in recruiting psychics for the event. The space was not large and did not offer a chance to really be confidential with a client without resorting to whispering. Still, she was there and resolved to make the best of it. As she set up the store owner stopped by to greet her and informed her, offhandedly, that she was reserving a large area toward the back of the store for the ‘main attraction’, a New Age author of channeled material who was coming in later to do readings of her own. My friend, really keying into the aura of the store owner, realized that it was all about the money for this person. She shrugged and, determined that she would never darken the door of the establishment again, turned away to make the best of the day. Business was slow but steady through the morning and, when lunch time arrived, my friend went off to a local restaurant for lunch. When she returned to the store, for the afternoon session, the ‘star’ channeler was setting up. I’ve included a picture above of the type of structure that she was assembling, only the one that my friend saw sat on legs so that the person being read could sit underneath it. 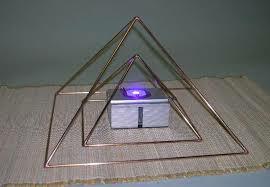 When the channeler finished the set up and ‘activated’ the crystal grid in and around the pyramid, my witch friend states that the energy in the store went completely dead, as though someone had turned on a vacuum cleaner and sucked the place dry. The lady of the story walked quietly to a nearby display of crystals, items which she was extremely sensitive to, and picked one up. Nothing. She looked around at the confused faces of the other psychics and knew that she was not imagining things. At this point, several of the psychics working the fair veritably stumbled out the door and my friend joined them. Cigarettes were lit with shaking hands by several of the group but no one spoke until one of the readers looked at my friend, well known for her skills, and asked her simply what the hell was going on in that store. The witch needed no further prodding but, using a quick method of trance induction, took a good hard look at the store and, particularly the channeler’s set up, with her other eyes. What she saw horrified her. Basically, the pyramid was set up and energized as a portal through which the creature (my friend actually used the word demon to describe this git) at the other end fed. The channeler placed the client in the pyramid grid, the being accessed their energy and fed freely while providing the channeler with information that would keep the client sitting there, mesmerized (in more ways that one) by the information and the ‘energy’ of the reading. It was very evident that this channeler had not tested her spirit and that the spirit had manipulated her into providing food for it, on a regular basis, as well as addicting the channeler to the power of being ‘psychic’. My friend went back into the store and quietly investigated further. She noted that the channeler, in addition to offering readings was selling channeled jewelry designs. Looking closely at the pieces (the only ‘live’ things in the store at this time), the witch quickly discerned that they were designed to open a hole in the aura of the wearer, making it easier for the spirit who channeled them to return for a snack later. With more than a touch of righteous indignation, my friend stepped out back of the store, called on her own helpers and essentially placed a cork in the portal feeding this entity. I know that this emergency magical patch was followed with some work by the entire coven later in the week. Interestingly, the channeler suddenly plead ill and took herself home shortly thereafter. As I have said, I knew the witch in question well enough to trust her veracity and happened to have met the store owner a few times so that I knew my friend’s assessment of her was accurate. I’ve also seen these types of symbiotic feeding relationships in my own work. Suffice to say that I offer this little story as just one evidence of the absolute need to know your spirits and be able to test them before putting any great trust in communication. A spirit that is on the up and up will understand and a spirit that is trying to manipulate you will go on to easier prey. Spend The Night In This House . . . I saw a little blurb on Facebook the other day. It contained the picture of the classic house that one sees in old horror movies – a huge ramshackle old building with windows like black eyes peering out at the viewer, daring him or her to enter. I am not a huge fan of the horror genre but I saw enough movies in my youth to have a good idea of the sort of creatures that might come crawling out of such a structure. Add to this a dark camera filter and the picture was decidedly eerie. The kicker though, was the caption, which stated simply : Spend the night in this house for a million dollars . . . would you? My reply, if this were for real and not a Facebook meme, would be: for a million dollars, you can sign me up for as many nights as you like. In fact, I would be happy to take up residence for a few months if that would make the challenger happy. I would be the last person on the planet to say that there is nothing out there to be afraid of but I will also be the first person to tell you that fear is often the result of perception. All you have to do is look at the hokey ghost hunting shows and you can see that, while these folks may be investigating some genuine disturbing phenomena (on occasion), most of what scares them is themselves. Because of the way the show is set up (i.e. to entertain with spookiness), the mindset of the crew is that there must be something to be afraid of. Consequently, any small noise, puff of air or house settling sound is liable to provoke a gasp reaction and set them running to ‘investigate’. In the same way, much of what effects people, even in genuine hauntings, is their mind set. Many investigators have noted the correlation between the client’s state of mind and the level and intensity of a haunting. Those people who view the phenomena around them as frightening and possibly the work of the devil or some other source of evil, are not only more frightened by the haunting but also seem to attract exactly what it is they fear. Those who view the phenomena as simply the presence of other, non-corporeal people, who are willing to set limits with those “people” and who do not “freak out” at the slightest manifestation of paranormal phenomena, are the ones who end up either living comfortably with their ghost or seeing it go away entirely. Now, I will state unequivocally that there are some hauntings that come about as the result of malevolent forces and need to be dealt with by a professional. I will also state that such hauntings are thankfully few and far between. The vast majority of people experiencing paranormal events in their home are not experiencing any sort of “demonic” issue – no matter how much the thrill seekers would like to believe so. Some hauntings appear to be of the “imprint” variety, almost as though the energy of an event is imprinted on the subtle fibre of an area. These can be erased by magical methods or simply left to degrade over time. The hauntings that need somewhat closer attention are those that appear to be the result of some part of the human soul complex being left behind after death. In these case, which can be quite frightening to the uninitiated, an investigative team needs to take a two pronged approach. First, once it is established that there is something truly going on in a home or structure, the team needs to provide the client with calm validation. Most subjects of a haunting, at one point or the other, ask themselves if they are crazy. The team needs to reassure the clients that they are not “nuts” and that there seems to be something going on in their area. While the validation is very important, perhaps the most important thing that any team can do in a case like this is let the client/s know that dead people can be interacted with as surely as live people can. If an unknown individual walked into someone’s home and made themselves comfortable, that person would likely be arrested for breaking and entering. The ghost, despite its disembodied state, has no more claim over a home or other structure that the living person and should be dealt with accordingly. A fine line needs to be walked in such cases. While the investigators need to show compassion for the client, they also need to show compassion for the disembodied occupants of a house or other location. A person or persons does not usually remain behind for the fun of it. The ghost has remained because of a powerful attachment to a place. The attachment can take many forms, from happy memories of a place to unfinished business to a trauma at or near death. Those who can communicate with spirits will tell you that a ghost is often either very adamant about remaining or very confused about why they are there in the first place. Sometimes, all that is needed to clear a haunting is to tell someone that he or she is dead and needs to move on. Certain mages and trained mediums can assist with this process. At other times, particularly when a ghost is unwilling to move on, a skilled spirit negotiator (a good example would be a Native American medicine person) can work out a “deal” between the clients and the ghost that both can be comfortable with. Compassion dictates that the team at least try this approach before having the ghost removed by more forceable, magical means. So, as I said above, I would be happy to spend the night in the proverbial haunted/monster ridden place. My perception would be of the “let’s see what this is all about” variety. What looks scary may simply be a call to compassion. Think on that the next time you see some TV ghost hunter flinging around holy water. As I have mentioned, while I do not watch a lot of TV, I do keep up with several paranormal blogs and podcasts. I was listening to Beyond the Edge Radio a couple of weeks ago and heard about a haunting case I had not seen referenced before, the so-called C2D1 Haunting which took place at SUNY Geneseo in NY state. Here is a quick recap of the case for those not familiar with it along with the requisite spooky photo reportedly taken during the height of the haunting. In many ways, the events that bedeviled Chris DiCesare followed the course of a classic, increasingly violent haunting. The events began with a voice whispering into Mr. DiCesare’s ear, calling his name, and escalated, over the course of several weeks to include alleged physical assaults and full body apparitions. Lon Strickler, one of the hosts of BTE Radio, a well known paranormal blogger, dug deeply into the story while Mr. DiCesare and his friend Jeff Unger were on the air. Strickler theorized that Mr. DiCesare was and is a “spirit beacon” – that is, someone who attracts the attention of spirits and with whom spirits will attempt to communicate. I would tend to agree with Mr. Strickler after listening to the interview and hearing some of the witness’ story in his own words. In Spiritualist terms, it sounds as though Mr. DiCesare might be a latent spirit medium, that is, a person who has a greater than average ability to sense and communicate with spirits. In Mr. DiCesare’s case, that ability has remained mostly undeveloped likely due to the fright he received in this episode. It is interesting to note though that the haunting was resolved when Mr. DiCesare faced his fears and actually talked to the spirit involved. Later findings indicate that this ghost might even have been distantly related to the percipient, something which could only serve to attract the spirit even more. Imagine, if you will, being locked in a liminal state where very few people could see or hear you and suddenly having someone come along who could not only see you and hear you but also happened to be related to you. Would you not give your best effort to communicating with that person if you had some manner of unfinished business or simply needed some instructions on what to do now? Again, in Spiritualist terms, this is referred to as laying a ghost. This episode, though, highlights a factor in hauntings that I think bears some attention. Like so many hauntings, this event began slowly and increased in intensity until it became an outright physical threat. Many modern ghost hunters would be quick to categorize this incident as a demonic haunting or at least the incursion of a negative or unfriendly spirit . . . and, they would be dead wrong. If a ghost is, as most people assume, some non-corporeal part of a human being then we can expect it to behave in a manner similar to humans. Ask any medium and they will tell you that being dead does not, of necessity, make a person smarter, friendlier, or more enlightened than you or I. It certainly can give a person a different perspective, if they are willing to learn, but those spirits who are earthbound are often locked into old behavior patterns from life. In this instance, Mr. DiCesare theorizes that the spirit in question was a distant relative who had been tortured and killed during the Revolutionary War period. I want you to take a few moments to step back and put yourself in this spirit’s place. You have been dead for over two hundred years and have been unable to pass over for whatever reason (it was not made clear in this interview). You see the opportunity to get some guidance from someone who can communicate with you and who is a relative. And suddenly, they are lashing out at you and even call in a priest to try to get rid of you. Your reaction? Please note that the haunting really escalated after the priest did the blessing trying to get rid of the ghost. As you or I would be, this spirit was angered and likely felt betrayed. It reacted accordingly and Mr. DiCesare’s situation got much worse before he finally consented to communication. Fast forward to modern day with ghost hunters stalking through homes, with holy water and so-called demonologists, seeking to cast out spirits simply because someone in the home got a fright. Now, everyone who reads this blog knows that I am all for taking it to the Intruders when they rear their ugly heads and that I have no problem with a real priest doing an exorcism after all the protocols of the Church have been met and it is determined that there is a demon present (although I might quibble about the type of spirit). It seems to me though that a lot of the so-called hostile hauntings out there might simply be caused by spirits escalating things in order to get someone’s attention. Once again, this is where having an experienced magical practitioner on a paranormal investigation team might yield good results. Even if the person is not a natural medium, they will likely know someone reliable and will have a good sense of when that person should be called in. Is it not far easier to negotiate with a spirit or ghost and find out what it wants than to plunge forward blindly in a manner that could aggravate the situation? Instead of calling the spirit out and attempting to get it to punch you in the nose, would it not be simpler and more effective to calmly ascertain what the spirit is after before pulling out the holy water and crosses? My advice to ghost hunters? Listen to the witnesses! Once you are fairly certain you are not dealing with a hoax or hysteria, look for the person around whom the activity seems to settle and have them sit down with someone experienced, someone who can protect them if the being is truly malevolent and try to negotiate a truce. No harm can be done by doing this and it may resolve the situation to the satisfaction of parties on both sides of the veil.